Border Patrol agents we spoke to aren’t sure how a border wall will change the dynamics between law enforcement and people trying to evade them. 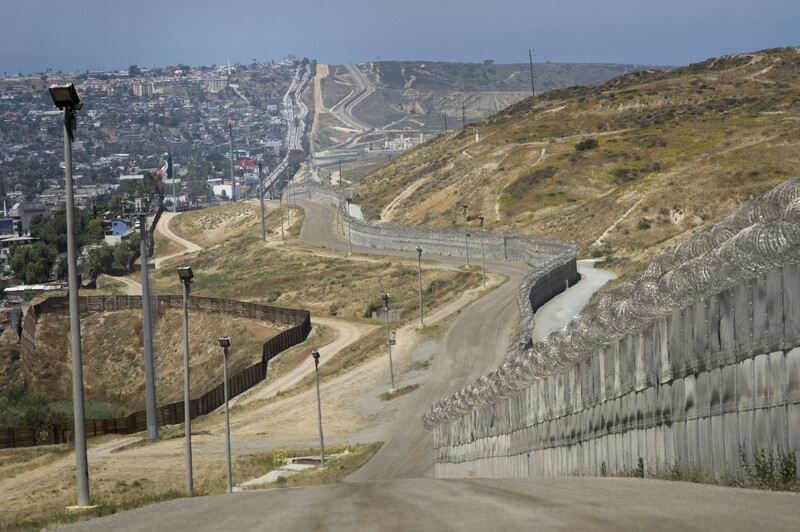 But drug tunnels, patches to the border fence and rings of concertina wire serve as reminders that for every measure taken to fortify the border, there have always been countermeasure to get around them. President Donald Trump continues to energize his base by promising to make the physical barrier that separates Mexico from the United States higher, stronger and more beautiful than ever before. The promise remains a crowd-pleaser for his supporters. The higher the wall, the more drugs we stop, the more “bad hombres” are kept out, the safer we are, the thinking goes. Of course, drugs and people will likely still go over, through, and under the barrier – whatever it looks like – just as they have for as long as the physical barrier has existed. In Otay Mesa, 15 miles south of San Diego, drug tunnels, patches on the border fence and rings of concertina wire serve as reminders that for every measure U.S. authorities take to stem the flow of drugs and people, there has always been a countermeasure to get around it. Since November, not all that much has changed for the men and women who patrol the 61 miles of border in San Diego. In fact, so far the biggest change may be influx of reporters who flood the agency with requests for interviews. Agents are typically happy to oblige and take reporters on ride-alongs, so long as they respect the first ground rule: “No questions about politics, OK? We don’t need everything we say getting politicized,” Border Patrol agent Tekae Michael, who grew up in nearby Chula Vista, told me recently. She turns south near Otay Mesa’s of stretch warehouses and heads toward the jungle of wire and corrugated steel that line the U.S. border. 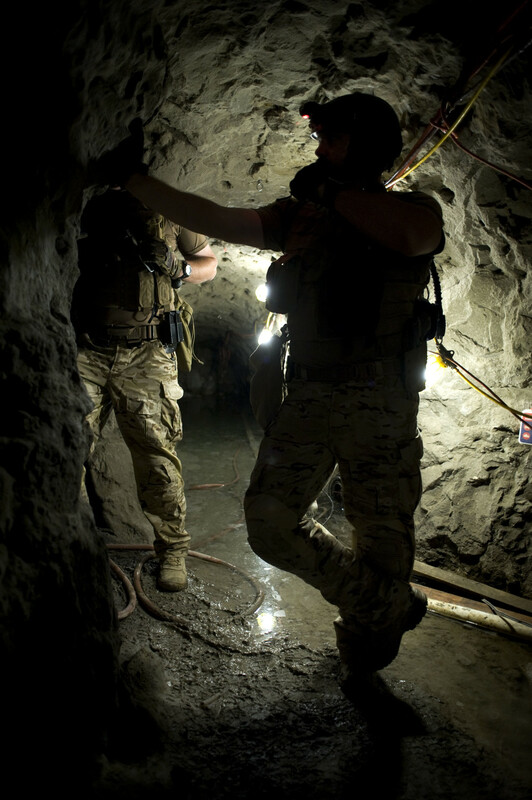 Michael slows the SUV as a group of Border Patrol agents come into view, members of tunnel rat team, a five-person task force – dressed in military gear, desert camouflage and combat boots – charged with detecting and closing down working drug tunnels. On this particular morning, they’re preparing to take a pool of reporters 90 feet underground, to the opening of the Galvez Tunnel. This tunnel, discovered in 2009, is one of 62 that agents have unearthed in San Diego County. It’s also one of the 29 they consider sophisticated – complete with ventilation, electricity, and when they found it, a working rail system to carry drugs north. Some even come equipped with elevators. “Bona fide elevators, with buttons to go up and down. Everything but the Muzak,” said Lance LeNoir, supervisor of the Tunnel Entry Team, called the tunnel rats. Tunnels start in Tijuana, sometimes under the noses of operating businesses. The entrance to Galvez, in fact, was disguised by a bathroom that lowered down to the tunnel’s opening. Crews tunnel hundreds of yards north and exit into one of Otay Mesa’s warehouses – perfect cover for smugglers to hide and wait for transportation to carry them to safer ground. Rarely do agents catch people in the act of digging, though they nabbed 13 when they discovered Galvez. The tunnel today is a place for the task force to train – practicing tunnel entry, testing out new tunnel-detecting technology and, of course, showing them to reporters. Agents latch us into a safety harnesses and guide us down four sets of ladders, one by one, into the hot, crowded darkness. Ninety feet below, at the foot of the tunnel, the air is damp and musty. Save for the water pooled near the base of the ladder, the tunnel is dry. Thanks to the claylike soil that makes this area ideal for burrowing, the tunnel keeps its shape. The tunnel itself is six feet high and four feet wide, tall enough in parts for LeNoir to stand upright as he paces, slapping sides of the tunnel and remarking on its craftsmanship. “This right here, if you can hit this from one end to the other, you’re gold. Very stable,” LeNoir said. “Unfortunately I can go 20 yards, either side of this thing, and it’s completely different story. I mean, these things collapse all the time. They are guaranteed to be on borrowed time. They will not last,” LeNoir said. Detecting tunnels consists of three pieces: technology, intelligence and infrastructure – or, the physical border barriers. Of the three prongs, it’s technology that lags behind. The tunnel task force has experimented with ground-penetrating radar devices, but rocky soil and a web of interconnecting sewage systems that run through the area interfere. The team instead relies on what LeNoir calls “good, old-fashioned police work”: knocking on doors and hoping to build sources who might alert them to suspicious activity at warehouses. Earlier this year, the Los Angeles Times reported at least six tunnels previously discovered by officials had been reactivated by cartels. Tunnels are sealed with cement after they’re discovered on the U.S. side, but not so in Mexico. Authorities estimate 20 tunnels remain largely intact on the Mexican side. Drug tunnels aren’t exclusive to San Diego County. Agents have found a total of 197 from Texas to California. The first cross-border narcotunnel was discovered in 1990, the brainchild of drug kingpin Joaquín “El Chapo” Guzmán Loera, head of the Sinaloa Cartel. For years, Chapo’s Sinaloa Cartel has held control of Tijuana and the smuggling routes along the border. The territory, though, is in dispute. Shifting narco-politics, accelerated by Chapo’s imprisonment, have given rise to Jalisco New Generation Cartel – a faction that broke away from Sinaloa and surged to power in the past five years – contesting Sinaloa’s control over territory and smuggling routes, including in Tijuana. But if New Generation wrests control of the area, it may not have the know-how and capital needed to pull off the tunnels, said David Shirk, associate professor of political science and international relations at the University of San Diego. “The critical question is whether they’ll have the financial capability to be able to use the tunnel model. They’re going to have to be able to finance a lot of money upfront, and they’re going to have to have the right connections. It’s not clear that Chapo’s tunnel diggers are necessarily going to work for his rivals. So there’s all kinds of questions there,” Shirk said. What’s more certain, Shirk said, is whether attempts to build up border defense – whether it’s building a higher wall, developing new technology or hiring more agents – will lead to more attempts to defeat them. Those countermeasures might include turning to light aircraft to fly drugs over the fence, launching them over with catapults or trying to corrupt law enforcement agents and use them for information or transportation, he said. “Over the last 10, 15 years we’ve seen Border Patrol agents who have either knowingly or unwittingly worked for organized crime groups. Either looking the other way to smuggle people or drugs into the country. In some ways that’s a lot cheaper and more effective than digging a tunnel,” Shirk said. Concern over rogue Border Patrol agents were renewed by an executive order Trump issued in January, which mentioned plans to hire 5,000 new Border Patrol agents along the U.S. border. Along with that came worry the agency would relax hiring standards to meet demand, potentially welcoming new agents prone to corruption – similar to what happened during the agency’s previous hiring surge. Just last week, San Diego Border Patrol agent Noe Lopez pleaded guilty to drug trafficking charges in federal court after he admitted to attempting to smuggle methamphetamine and cocaine into the U.S. in exchange for cash. Back in the SUV, Michael drives west from the warehouses toward the beach, where fencing gives way to the Pacific Ocean. She highlights points of interest like a guide on a history-of-drug smuggling tour. Michael slows to point out the spots where repair crews have patched holes after people cut through the fence. Just last year, crews repaired 550 places where people had cut through or damaged the fence while trying to cross. Of 46 miles of total fence in the San Diego sector, 13 miles consist of two sets of fences that run parallel to each other. The primary fence, closest to Tijuana, stands about six feet tall and is made from repurposed steel that airplanes landed on during the Vietnam War. That fence, built in 1991, is easily scalable and couldn’t prevent people from crossing. The bigger hurdle is the pedestrian fence several hundred feet north, built in 1997 – an 18-foot fence made from steel-wire mesh, with holes too small for fingers and toes. Along the top are rings of concertina wire that can cut or snag those who attempt to scale it. Climbing the fence would be difficult, but not impossible. And every now and then, someone makes break for it. “Smugglers will jump this primary fence, run across to the secondary fence, make a cut with whatever they have – blow torch, Sawzall, we’ve seen them use axes. They can make a cut and get through in about 30, 45 seconds,” said Michael. Concrete might sound like a viable solution, but it proved an expensive and ineffective option when authorities tried it in the past. At one point 1.8 miles consisted of concrete bollards, poles pounded into the ground, which Michael says cost roughly $1 million a mile. But after smugglers used a simple carjack to lift the material between the pillars, and agents had to replace the entire pillar instead of simply repairing it, they realized the option wouldn’t be as cost-effective as they hoped. So fences have remained the mainstay. Most often smugglers cut through the fence nearest the warehouses or Plaza Las Americas, an outlet mall several hundred feet from the border, where they can more easily blend in with the public if they make it to the U.S. side. Other times, people will just go over the top of the 18-foot fence, concertina wire and all. People will fling rope ladders over the top, then use rugs or blankets to cover the wire. Border Patrol says it gets little help from Mexican authorities when that happens. While it remains against the law to smuggle people and drugs into the U.S., it’s not against Mexican law to jump the fence from the south side. Of course, it is against U.S. law, and those who are caught are detained and likely deported. Last year, Border Patrol apprehended nearly 32,000 people in the San Diego sector, a number that includes all apprehensions, not just those attempting to jump or scale the fence. That was an uptick from the previous three years, but nowhere near its peak. In 1986, San Diego Border Patrol apprehended 628,000. While construction on prototypes for a new border wall will start sometime between now and September, already schedules have been pushed back and plans for the wall continue to evolve. And Michael isn’t sure how any of it will change the dynamics that play out between law enforcement and people trying to evade them. “I don’t know what kind of wall they’re looking to build, what it’s going to look like, whether it’s going to be added onto infrastructure that’s already here, or if they’ll add a whole new layer,” Michael said. Agents have a pretty good sense, however, that more resources are on the way. And that, at least, is welcome news. “Whatever they give us, we’ll take it. That’s my opinion,” Michael said.